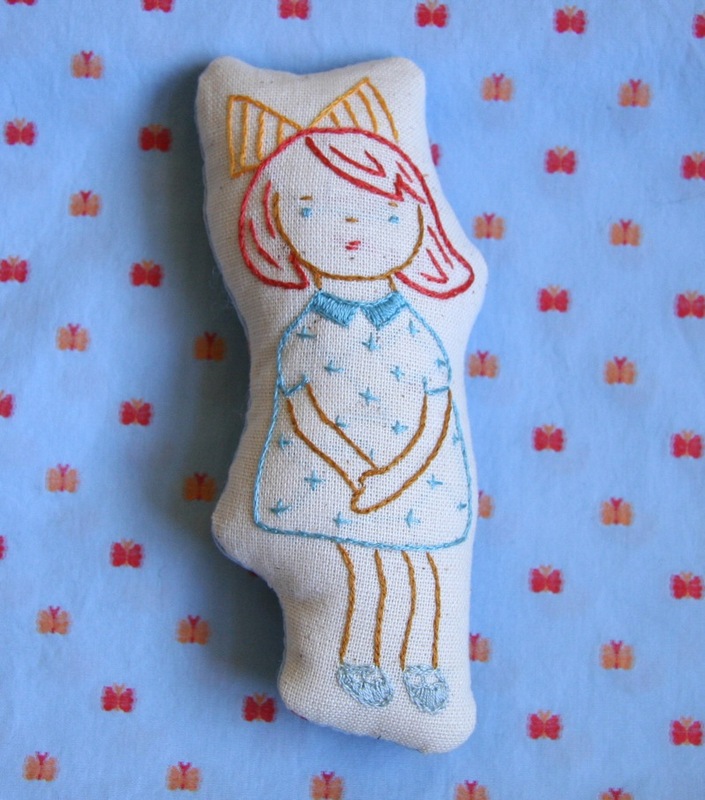 I’ve made another little (6" tall) embroidered doll for a baby gift. I’m working on matching booties and bonnets for each of the gifts and then I can switch over to another little baby that’s coming soon, my neice Maggie! My sister and I have picked out some beautiful fabric for her quilt. Now I just have to figure out what to do with it. beautiful hilary! what lucky babies!! ADORABLE!!!!! You are so talented!!! Love these little dolls. And that background fabric is delish, too! The hair movement is wonderful. you are so amazing! this is perfect. what a lucky lucky baby! 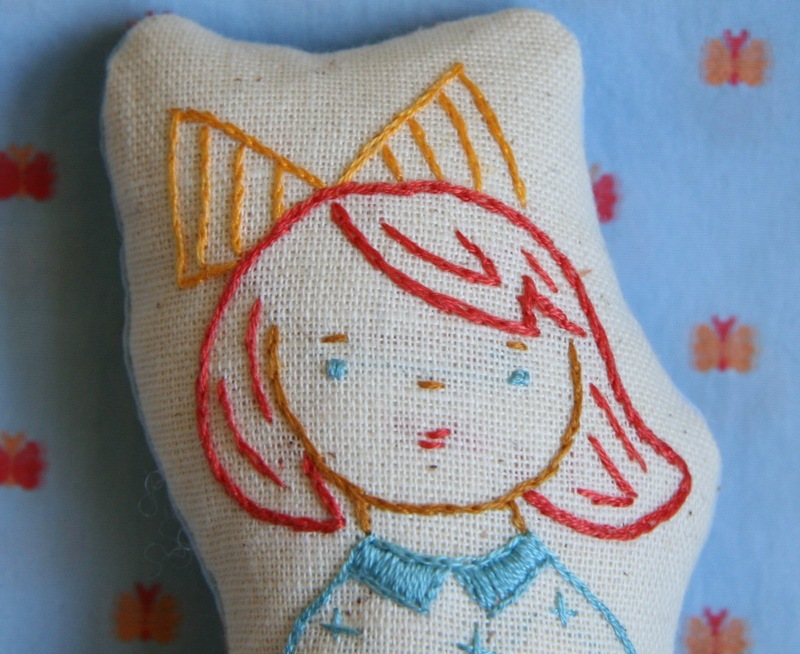 i love these dolls, the simple shape and the clean embroidery. throw in a matching bonnet and booties…heaven! Again, very beautiful!! Excellent detail! so sweet and perfect for a baby! I gasped when I saw this — She’s so appealling — her face and stance, fantastic! The retro colors make me drool. Truly wonderful. Lovely, Hillary. Your stitches are so teeny and perfect. i love her little red hair! Wow! Your detail is incredible. Bravo! She is just gorgeous. Great job! so precious! you are so talented, hillary! Lovely embroidery Hillary! Your little dolls are so charming, and I’m sure they will become cherished keepsakes in the future. it’s wonderful, hillary. looks like the little girl is staight out of the pages of a vintage children’s book. I love the embroidery. I have been working hard on a few baby gifts myself and it has been a lot of fun. For these are you sketching them and then doing an iron transfer? Again wonderful work as always. so so lovely. so sweet and adorable. just love this! wow, look at all those perfect little stitches. i just love it. really cute… can you recommend any good embroidery book resources? i really need to work on mine! Your things are always so cute. I really love the redhead girl… she is precious!!! i just read your blog for the first time and i saw in one of your days that you were looking for printer-sticker paper. i used to do that to but now i have xyron machines and you can turn anything into a sticker! you should check it out–it has changed so much of what i do and opened up a lot of possibilities…let me know if you have questions or trouble finding info. This is lovely. Another reminder I haven’t embroidered for awhile. What a precious gift for a baby. oh! how sweet! i love her bow and her shoes. her wee shoes! lovely. what a wonderful gift for a lil one. a baby gets her?? i mean-i wouldn’t fight a baby for it-but if I WERE to fight a baby for it-I’d win. I’m just saying.